An Iris left by my predecessor, at its brief peak. and Tulipa sprengeri, the last tulip. Centaurea montana 'Amethyst in Snow' - astonishingly, its first appearance in this diary - one of my favourite plants, which I selected in 2000 in the Sahin perennial research nursery in Boskoop, and now sold in large numbers around the world under this name or as 'Purple Heart'. A corner of the fern border: flowers are really not necessary! Best in show: the Laurent-Perrier Garden, by Luciano Giubbelei: immaculate in every way. The moonlight colours of the flowers were a lovely contrast to the predominating purples and blues. The low Beech domes are very special, and look how the steps go down under water. Almost too perfect, the Telegraph Garden (Tommaso del Buono & Paul Gazerwitz) - but actually very satisfying. Modern, yet umistakeably Italian. Kennst du das Land, wo die Zitronen blühn? The river of Iris sibirica in Hugo Bugg's RBC Waterscape Garden was exquisite. Fine planting, done by Louise Venter, undoubtedly propelled the RBC Waterscape Garden to its gold medal. The early morning light slanting through the plantings in the Garden for First Touch at St George's (Patrick Collins) created a wonderful effect; further up the slope the planting included a lot of nice ferns. Paradisaea lusitanica (appropriately) and Hesperis matronalis catching a shaft of sunlight in Cleve West's evocation of a Persian paradise garden, for M&G. The judges evidently found serious flaws with the BrandAlley Renaissance Garden (Paul Hervey-Brookes), giving it a bronze medal, but I loved it. At least I loved the left half of it: the herbaceous border was out of place. With symmetrical hedges it would have been perfect - no flowers needed. Avon Bulbs featured the dark-leaved honesty, Lunaria annua 'Chedglow, which attracted a lot of sttention. Immaculate brassicas, part of the Southwest England in Bloom exhibit. Cayeux irises, fully open this year! The revolution in growing cypripediums from seed makes this display by Jacques Amand possible. The tremendous diversity of foxgloves exhibited by the Botanic Nursery. The alpine beauties shown by Kevock Gardens were struggling a bit with the heat, but still looked radiant today. A general view of the Great Pavilion, filled with excellent displays. The media coverage of the show gardens is disproportionate: let's hope the BBC gives decent attention to the Pavilion during its coverage of the show. The portrait of Nelson Mandela created from the bases of Protea flowers by the Kirstenbosch team: it takes form when viewed from a distance. English tulip 'Doctor Hardy' in its flamed manifestation, showing a broad streak of contrasting colour down the centre of the petal as well as round the edges. For several years I've wanted to visit the Wakefield and North of England Tulip Society's annual show, the only event in the world where enthusiasts of the English florist's tulip can exhibit their blooms - and did so this afternoon. Founded in 1836 the society is a remarkable survivor of the English tradition of 'florists', enthusiasts growing a group of plants selected for floral perfection - auriculas and laced pinks being other examples. Fancy poultry are analogous, with feathers substituted for petals. As with all such enthusiasms, there is a complex set of expectations for a good flower - it's shape, colour and markings are all important. The shape of an English tulip should be rather rounded, and the flowers are rather smaller than the majority of contemporary 'Dutch' cultivars, and the colour range is more limited. The three colour classes, rose, bybloemen and bizarre, are illustrated below. An English tulip starts as an unblemished flower, with a variously coloured base and the main part of the petal uniformly coloured. These are called breeders, and they may remain like this indefinitely. If, however, the plant becomes infected with Tulip Breaking Virus, the ground colour changes, and the petals become variously streaked with a darker shade, often to very beautiful effect. When the streaking is predominantly round the petal edges, the flower is described as 'feathered'; when there is a broad central streak as well it is 'flamed'. In consequence, a cultivar can be exhibited in three states, and this gives the unique character of the show and society - a display of gorgeous, but often diseased blooms. Growing the perfect bloom is not easy, with careful attention to timing for the show, but I was extremely impressed by the quality of the flowers, all displayed in beer bottles in the traditional fashion. Enjoying the show was an enthusiastic crowd, knowledgeably inspecting and commenting on the exhibits, and partaking of a lavish spread of lunch and tea. One can see why people would become hooked, and the Society offers a starter pack of bulbs to new members: it was an easy decision to join up and I look forward to shows in future years. A rainbow of colour on the showbench, with the flowers being carefully studied. The three colour categories of English florist's tulips: L Rose, shades of pink with a white base; C Bizarre, reddish shades with a yellow base; R Bybloemen, bluish or purplish shades with a white base. These are breeders, which are not showing signs of virus. The bizarre breeder 'James Wild', a lovely soft mahogany colour. 'James Wild' with the virus, in this case creating a feathered flower, with the colour break mostly confined to the edges of the petals. A class for 12 blooms, all different, of 'rectified' tulips, i.e. broken with the virus, in bizarre, bybloemen and rose colours. 'Adonis' - a feathered bybloemen. As with all the many hundreds of previous episodes, this programme is available from the In Our Time webpage, a perennially fascinating resource. "Chlorophilia (Greek: chloros pale green + philia love) is a physical or sexual attraction to plants, particularly trees. The term was coined by journalist Bill Hoss in 2004 to describe scientists who take on an attraction towards Bonsai trees. 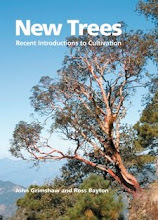 Overview: Although Chlorophilia is practiced little in the world, Chlorophilia is sometimes attributed to activities like tree-hugging, or an over-the-top interest in Gardening. There are no laws that ban Chlorophilia in any country in the world." So I'm happy to confess to loving the colour green, but don't dare call me a chlorophiliac. Green should be the predominant colour in the garden, the foil against which other colours make a contrast, in this case Rhododendron aberconwayi in Ray Wood this morning. Rhododendron vaseyi (Harry White's form) in Ray Wood - a very beautiful azalea from the Carolinas. Ivor Stokes expounds the fine points of judging at the Harlow Carr Rhododendron Competition on Saturday. Our first-prize winning arrangement of Rhododendron foliage - a first was also awarded to the other exhibit in the class from the Himalayan Garden. They won the competition on aggregate points, a whisker ahead of our entries from Ray Wood... It was a nice opportunity to celebrate the foliar beauties in the genus. We also put on a display about the garden in Ray Wood, seen here with Jonathan Watkinson and volunteers Gill and Vic, who with the rest of the volunteering team have brought it back to its present resurgent state. Between the heavy showers RHS Harlow Carr was looking good, with many big pots crammed with tulips and other bulbs making a great display - here a selection of Viridifloras. Camassia leichtlinii 'Caerulea', a signature plant at the Yorkshire Arboretum, catching the evening sunshine on Friday. Euphorbia x pasteurii after a shower; it is remarkably successful here at Settrington, growing well in the open border. Narcissus poeticus subsp. radiiflorus - the last daffodil of the season here. A squinny thing, but bringing back nice memories of the meadows of Epirus. The purple-leaved prostrate dandelion, Taraxacum faeroense in the gravel bed here. Yes, I even grow dandelions! Polystichum setiferum 'Iveryanum' at its perfect moment. 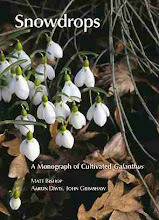 In this diary I have frequently acknowledged the importance of EA Bowles's My Garden trilogy to my development as a gardener: read as a schoolboy (and many times since), his pen portraits of his plants and garden vividly convey the significance of plants as individuals as well as in the garden whole. Although written as the stormclouds of the Kaiser's War gathered they convey nothing but charm and horticultural tranquillity in the plot of a gentleman of leisure. A golden afternoon, perhaps, but now, a century later, the text is just as interesting and inspiring to a plantsperson as ever. To celebrate the hundredth anniversary of the publication of the first two volumes, My Garden in Spring, and in My Garden in Summer in 1914 ( My Garden in Autumn and Winter followed in 1915) the EA Bowles of Myddelton House Society has staged an exhibition entitled 'Centenary of a Gardening Classic' at Forty Hall, Forty Hill, Enfield. I was fortunate enough to be able to attend the opening on Thursday evening, when I took these iPad snaps in poor light. The exhibition is on until 27 July and well worth seeing if you are in the vicinity, along with the increasingly splendid gardens at Myddelton House and the renovated Forty Hall itself, where there is a most magnificent Cedar of Lebanon on the lawn. The exhibition was opened by Simon Parker-Bowles, EAB's grand-nephew (who grew up at Forty Hall), with a welcome from Jackie Kingdom, Chair of the society. A major part of the exhibition consists of photographic portraits of plants mentioned in the trilogy and still growing at Myddelton House, captioned with a relevant quotation. This is Carex elata 'Aurea', Bowles's Golden Sedge, which he found as a sport while collecting insects in the fens. There are some exhibits of Bowles memorabilia, including a full front pag of the Enfield Gazette and Observer devoted to him after his death: he was greatly loved in the community. The interior of Forty Hall has recently been restored, highlighting the period of Sir Nicholas Rainton, occupant and Lord Mayor of London in the early Seventeenth Century. There are some lovely ceilings and features such as this mantel. The Bowles family owned Forty Hall for a few decades and made some changes, including the addition of this window with a punning crest featuring a bee and several owls.